Tapas are the wonderfully tempting little dishes of food that are traditionally served with sherry in southern Spain. Beautifully simple, tantalizingly delicious and easy to prepare, they are perfect for all kinds of occasions.The recipes and suggestions in this book demonstrate how simple ingredients can be quickly transformed into mini feasts designed to delight the senses. Among the recipes are salted almonds, bread with olive oil and garlic, salt cod, asparagus with 2 sauces, chicory and blue cheese, mushrooms with garlic and rosemary, aubergine puree, broad beans with ham, tortilla, pickled sardines, spiced mackerel, lamb ribs with paprika, beef in red wine, potted game, croquettes, empanadas and many, many more. 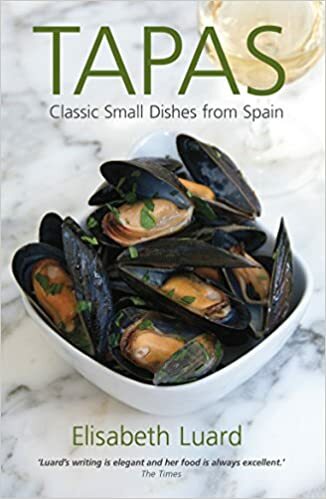 In addition there is plenty of helpful advice including a selection of menus that show how to combine tapas to provide meals for every occasion – such as spring, summer, autumn and winter parties, children’s tapas party, vegetarian tapas party and a no-cook tapas menu. The wealth of background information and the superb collection of recipes vividly evokes the spirit of a country where food is the essence of the community. work on. You've done a formidable job and our whole community will be grateful to you.